We are beyond excited for Fun Fun Fun Fest [Purchase Tickets] next month. After months of festivals it's about time to wrap things up for the year with one of our personal favorites. It all goes down November 7th and 8th but we are happy announce we have not one but TWO ways to kick off the weekend. 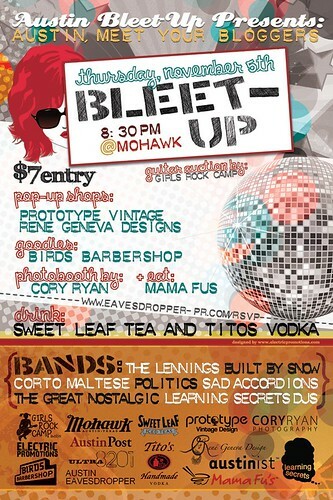 First up we have the Austin Bleet Up presents: Austin, Meet Your Bloggers on Thursday, November 5th at The Mohawk. After such a great run at the last Bleet-Up we knew we had to team up with the amazing Austin Eavesdropper for another round. And this time we brought bands. If you write a blog, read a blog or just need a reason to go out this is the event for you. There will be food provided by Mama Fu's, complimentary drinks from Tito's Vodka, Sweet Leaf Tea, and Birds Barbershop is even giving away Free Lone Stars to the first 50 guests! (so get there early). Cory Ryan is setting up the photo booth and there will also be pop up shops by Prototype Vintage and Rene Geneva Designs. And the music.. Oh the music. We will have live performances by some of Austin's finest with sets from Corto Maltese, Built By Snow, The Lennings, The Great Nostalgic, Sad Accordions, Politics and DJ Sets by the incredible Learning Secrets. Knuckle Rumbler is joining in the Fun Fun Fun Festivities by producing the latest addition to the Friday night pre-parties. Combining forces with Champion Scion, My Old Kentucky Blog, Austin Town Hall, Do512, Sailor Legs and (us) Ultra8201 we have put together a 2 stage line up that is destined to melt your face off while the rest of your body hits the dance floor. On the Meat on a Stick Stage (indoor) get your rock cocked with Ideal Soul Mart, heavy metal ABBA cover band StABBA, the San Marcos thrashers Zlam Dunk and Stillwater natives Colourmusic. These aren’t appetizers, these are each a full course meal on their own. 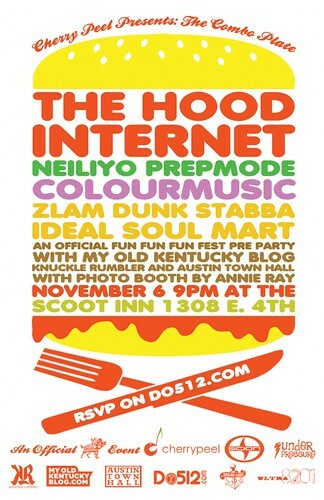 For those wanting to get more down and dirty the Nugget Sauce Stage (outdoor) will be providing beats courtesy of Prepmode, birthday boy and local legend Neiliyo and our main entree: THE HOOD INTERNET!! !